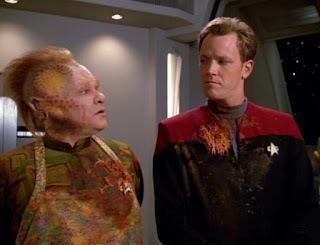 Star Trek: Voyager is still liked at The Angriest, with the review of the Season 2 episode "Parturition" being the most popular post of February 2018. Other popular Voyager reviews included the episodes "Persistence of Vision" and "Tattoo". Over at FictionMachine, and far and away the most popular film review for February was for The Shape of Water. February's total output consisted of one full-length essay, eight reviews of new films, 12 reviews of older films, eight TV episode reviews, one manga review, and short reviews of 41 comic books. A full index of reviews and posts - including those at FictionMachine and FilmInk - is included below.